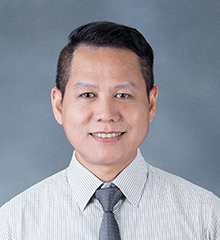 I graduated with a Bachelor’s degree in Library Science from Chiang Mai University in 1994. I have a year of experience as a Project Coordinator at a Japanese company and 13 years as a Librarian at Assumption University. I was awarded ‘Staff of the Year’ in 2007. I decided to join St. Andrews because working as a School Librarian one has to learn how to do all kinds of tasks, such as purchasing, organising and servicing, which keeps me on my toes. My friends say that I am kind and that I always greet people with a smile. I have made my career working in the libraries of education institutes for 18 years. I’m adept at book and magazine management systems and at e-resource retrieval. I always perform my work with good service in mind. My hobbies are playing badminton, singing and sometimes dancing, reading and meditating. I have two little kittens. I donate to and join in with temple ceremonies at least once a month. Working at this school is different from my university work. In the university I usually dealt with Bachelor's, Master's and Doctoral students and professors. My work was all about education but my work was advising them how to do research and how to locate paper and e-resources. Working in this school is quite different because I am involved with the running of the library as a whole: purchasing, book and magazine organising, teaching students how to search and managing borrowing and returns. I work in particular with young students. It makes me cheerful and positive about the future of mankind.